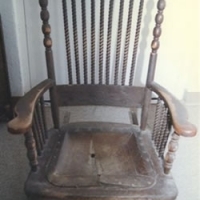 At Little Jack Horner’s, we specialize in restoring antique furniture to its original condition and beauty, using the appropriate stain colors and finishes for that piece’s period. To the extent possible, we honor the original maker’s design intention so as to preserve the intrinsic value of your cherished piece. 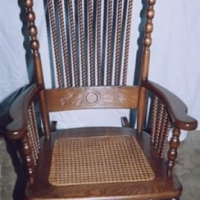 Circa 1900's oak rabbit ear rocker with a pressed back and hand woven cane seat. This family heirloom had been ignored in storage for years. 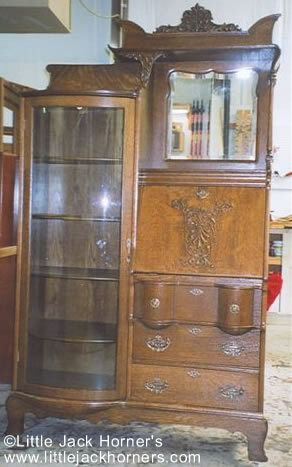 After a complete restoration, the beautiful wood and intricate details can be seen again. 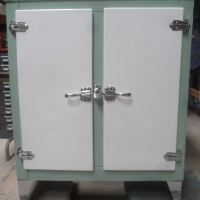 Now this lovely piece is ready for another century of use. 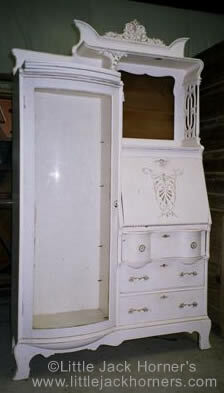 Early 1900's oak secretary/bookcase that had been painted white. 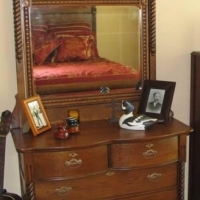 Now a fine addition to the client's home, restored to its original condition. 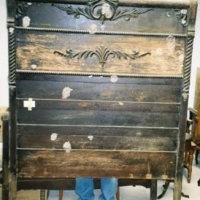 Fine American oak antique bed, painted black with distressed and neglected wood. 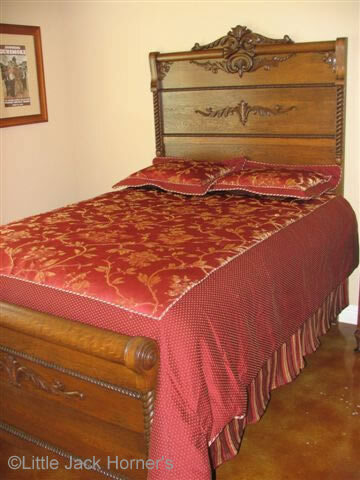 After restoration, the wood is returned to its former glory and the bed is a spotlight piece. 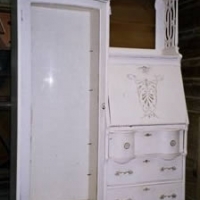 Antique dresser matching the painted oak bed, with the same wood and decorative issues. 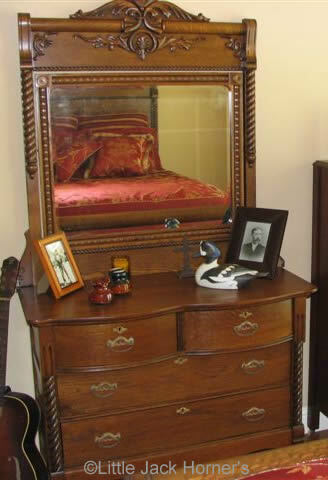 Antique dresser matching the painted oak bed, restored to its glorious oak finish. 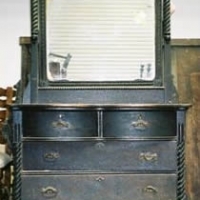 In the late 1800's, Solomon Karpen founded S. Karpen & Bros. Furniture in Chicago. 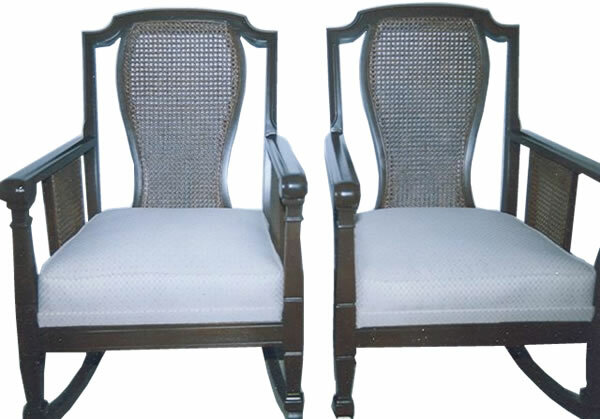 It became the largest upholstered furniture manufacturer in the world. 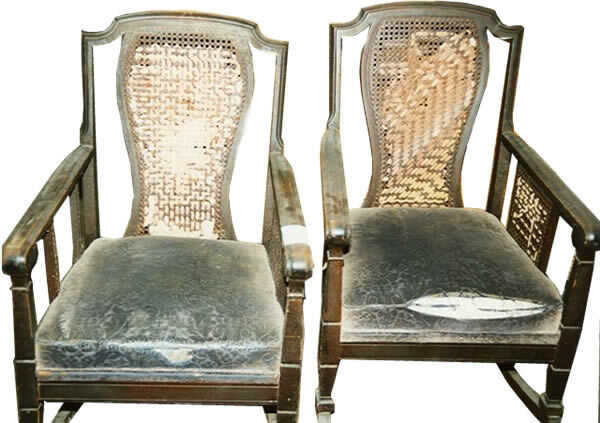 These 1920's Karpen & Bros. rockers belonged to our client's mother who "repaired" the cane backs with nylon stockings. 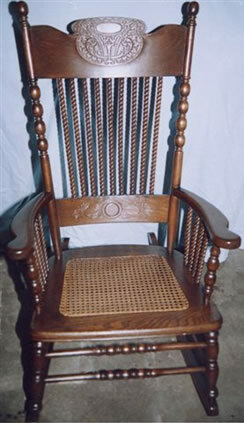 Her grandchildren now enjoy the fully restored rocking chairs. 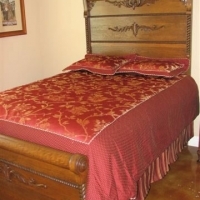 Kittinger has been a name associated with quality American made furniture for decades. 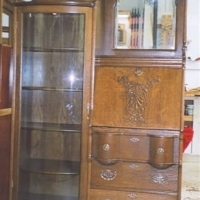 This 1950 dining room suite was rescued by our client after her mother sold it to a handyman. 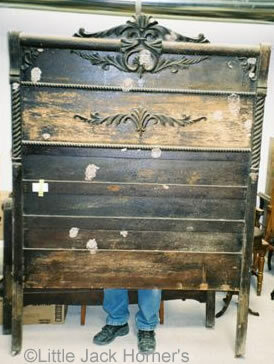 It had been stored in a shack and was severely damaged. 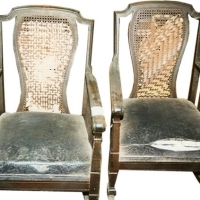 The chairs were in tatters and the table in pieces. 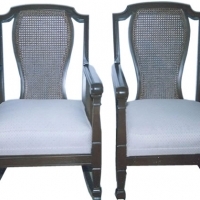 After a complete restoration the beauty and quality of this elegant set is once again apparent. 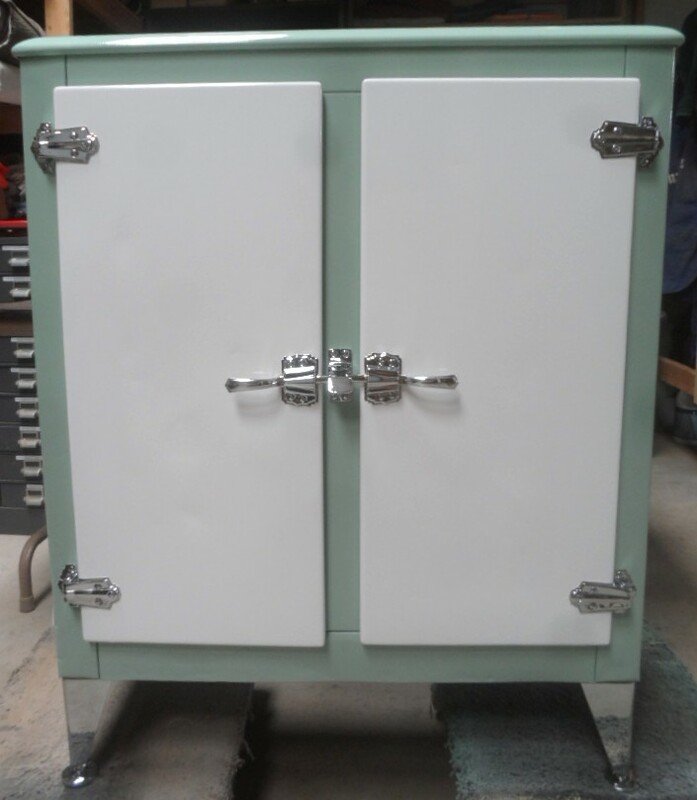 After finding a small spot of undamaged paint, we were able to restore this antique ice box to its original color. The chrome legs are a close representation of the originals which had been missing for who knows how long. 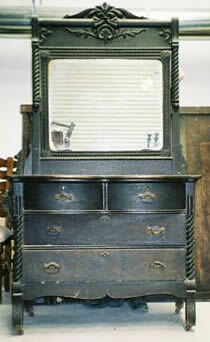 Now a great accent piece for any room. 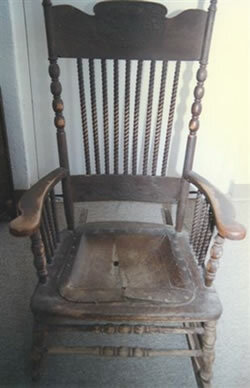 Read the real story of "Little Jack Horner," which also explains where our company name & first logo, above, originated. Copyright © 2019 Joe Hornor. All rights reserved.